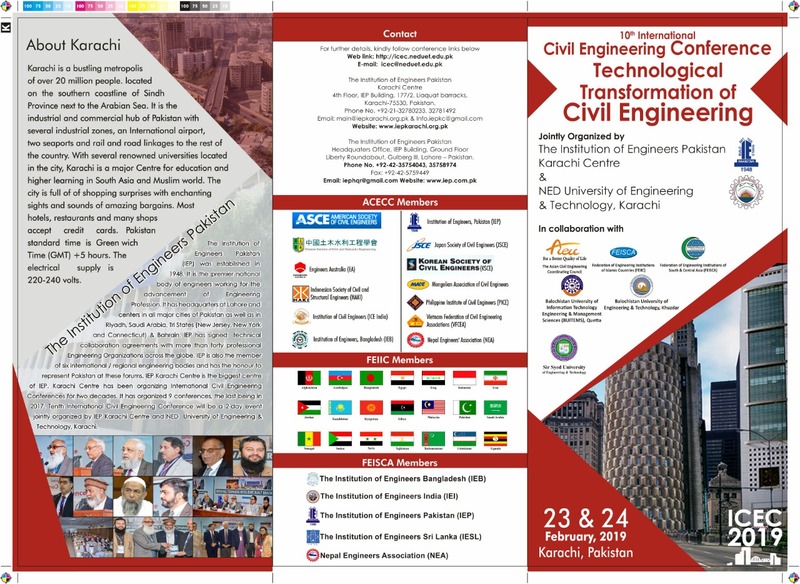 International Civil Engineering Conference (ICEC) is a regular feature in the calendar of events for Institution of Engineers Pakistan and NED University of Engineering and Technology, Karachi. It is being organized frequently for almost two decades now. Nine International Conferences have been organized in the past. Every year, the ICEC is held under an innovative theme reated to contemporary issues that relate Civil Engineering and Socio-economics of the society. 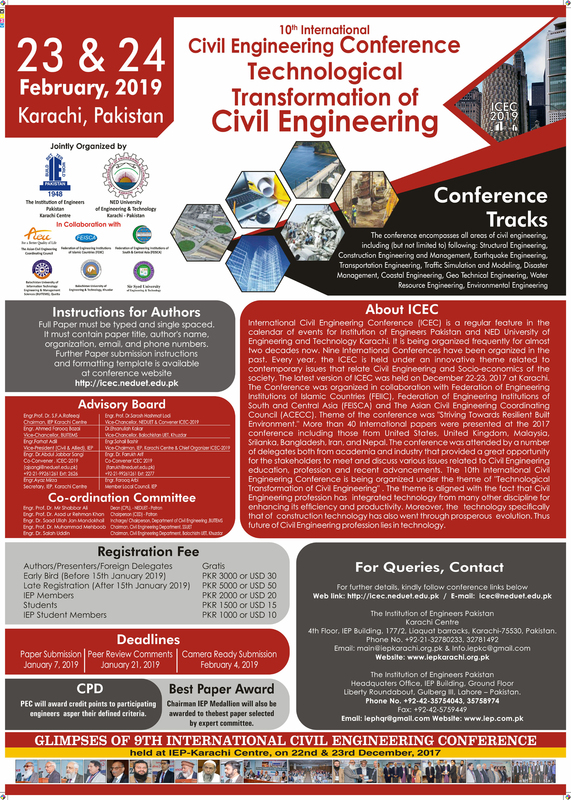 The latest version of ICEC was held on December 22-23, 2017 at Karachi. The Conference was organized in collaboration with Federation of Engineering Institutions of Islamic Countries (FEIIC), Federation of Engineering Institutions of South and Central Asia (FEISCA) and The Asian Civil Engineering Coordinating Council (ACECC). Theme of the conference was "Striving Towards Resilient Built Environment." More than 40 International papers were presented at the 2017 conference including those from United States, United Kingdom, Malaysia, Srilanka, Bangladesh, Iran, and Nepal. The conference was attended by a number of delegates both from academia and industry that provided a great opportunity for the stakeholders to meet and discuss various issues related to Civil Engineering education, profession and recent advancements. The 10th International Civil Engineering Conference is being organized under the theme of "Technological Transformation of Civil Engineering" . The theme is aligned with the fact that Civil Engineering profession has integrated technology from many other discipline for enhancing its eficiency and productivity.Moreover, the technology specificaly that of construction technology has also went through prosperous evolution. Thus future of Civil Engineering profession lies in technology.